Reciprocating saws are a style of power saw that work by a push-and-pull blade motion. Reciprocating saws are often called sawzalls or saber saws, but the term sawzalls was actually coined by Milwaukee Electric Tool Company, which has trademarked the term. While a reciprocating saw can refer to different saw styles like the scroll saw or the jigsaw, it most commonly is used to describe the power handsaw. 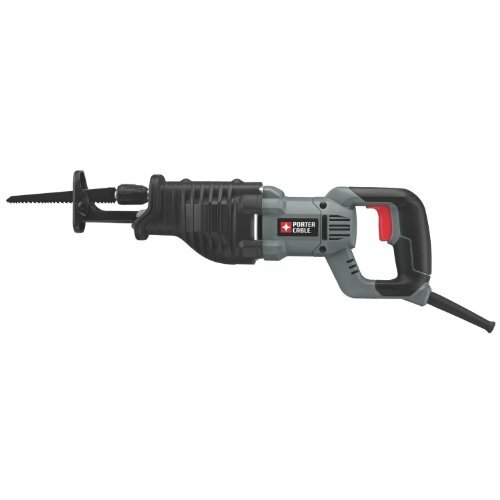 It resembles closely a hammer drill, and is designed primarily to be used on both vertical and horizontal surfaces. Most of the time a reciprocating saw is used on construction sites, particularly for cutting out wallboard and working on vertical surfaces. Most reciprocating saws will include speed variance functionalities so that the blade will actually move up and down, in addition to back-and-forth, making it easier to perform difficult cuts. As well, a foot is often located at the base of the blade so that you can steady the saw as you are cutting. The 20-volt, 6 lb., battery-powered DeWalt reciprocating saw is one of our favorites. It comes equipped with an LED light to help brighten dark work areas, provides a variable speed trigger, and a 4-position blade clamp for flush cutting. You will have to purchase the battery separately because this is a bare tool item. 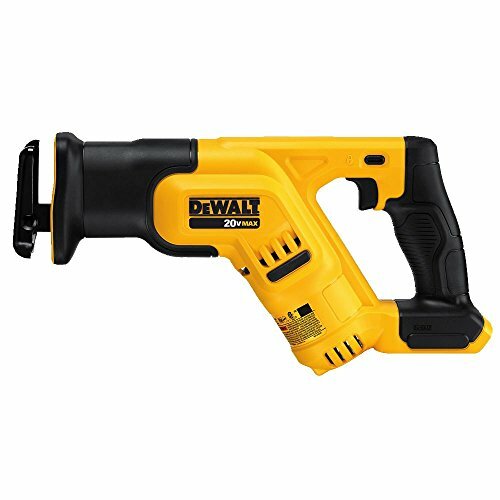 Any 20 volt battery will work in conjunction with a DeWalt 20 volt charger. Buyers say that this saw is a pleasure to use, providing exceptional control and the lithium batteries run for a very long time. A handy, powerful and efficient tool, it has many satisfied users. In terms of drawbacks, some buyers have noted that the trigger could be a little bit larger, saying that a trigger that is two-finger wide would be more helpful. As well, you can expect some pretty heavy vibration using this tool so be prepared to use gloves and take breaks every couple minutes. That said, let's take a look at five of the best reciprocating saws on the market today and see how they compare. The Dewalt compact reciprocating saw is well-made, durable, and convenient if you need to make cuts in confined spaces. Users love the compact design, but some do note that the batteries and the charger are not included in the package. With a length of 14.5 inches, this cordless reciprocating saw has a 4-position blade clamp, a stroke length of 1-1/8″, a pivoting shoe, a variable speed trigger, and an SPM up to 2,900. It also comes with a bright LED light for working in dark areas. Overall, users agree that this is a durable sawzall of high quality. A buyer shares that it’s a real pleasure to use this top rated reciprocating saw and that he likes the unique design, which gives him more control over the cutting. Another reviewer states that this is a powerful, efficient and handy sawzall tool, and it can cut through heavy gauge metal with no problems. A happy user comments that the Dewalt reciprocating saw is the best one available and the fastest sawzall that he has ever seen. He highly recommends it to anyone in need of a reliable reciprocating saw. However, some customers have complained that this battery operated saw vibrates too much and that it’s difficult for them to use it for longer periods of time. A user also complains that there is no dial for maximum speed and that it’s uncomfortable for him to control the speed with the trigger. The Skil 9-amp reciprocating saw is powerful, heavy-duty, and efficient. Users love that they can change the blades easily and without any tools, but some do note that it doesn’t come with a storage case. With a size of 18.5″ x 4″ x 8″, this corded reciprocating saw has a powerful 9-amper motor, a pivoting foot, an adjustable speed limit, a power indicator, a heavy-duty gear housing, and it comes with one woodcutting blade. The stroke length is 1.125 inches, and you can do up to 2700 SMP. Overall, this is an efficient reciprocating saw, but you should be aware that it’s made in China. In general, users are extremely satisfied with the Skil sawzall tool, and they praise its powerfulness, durability, and usefulness. One buyer commented that he used this electric sawzall on an old tree house, and he managed to take it apart for an hour. The reviewer also states that even though the saw is very powerful, it’s easy to control it, and he would recommend to anyone looking for the best reciprocating saw. Another customer shares that this sawzall is excellent for pruning, and it’s easy to work with it, even if you have never had experience with such saws. However, some customers have complained that since the speed control is separate from the trigger, it’s difficult to change the speeds while cutting. One user is dissatisfied with the blade holster design, and he states that the blade regularly comes out when he saws through metal. The Black Decker reciprocating saw is durable, well-designed, and a reliable tool for cutting through wood and metal. Users love the cutting power and the lightweight design, but some do note that there are no batteries or a charger included. With a size of 15.6″ x 3.4″ x 7.1″, this cordless sawzall has a stroke length of 7/8 inches, a variable speed trigger, a pivoting shoe, an SPM from 0 to 3000, and it comes with one reciprocating blade. The maximum initial battery voltage is 20 volts, and as a plus, you don’t need any tools to change blades. As a whole, users agree that the Black Decker cordless reciprocating saw is practical, reliable, and comfortable. One buyer mentions that it’s very easy to use this sawzall, and you can cut through anything with it. Another happy customer comments that the saw is well-constructed, solid, and perfect for cutting down branches. A purchaser also stated that he was very surprised how much wood he could cut down with this powerful recip sawzall with only one battery charge. The reviewer would have preferred if the saw came with a storage case, but he is immensely satisfied with its performance and the price. 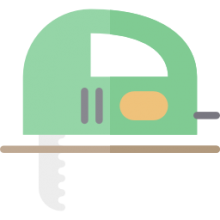 However, some users have complained that this small reciprocating saw vibrates too much or that it stopped working after a couple of weeks. Some also warn that the battery and the charger are more expensive than the saw itself. If you are looking for an efficient, durable reciprocating saw, which you can use for your DIY projects, you might consider the Porter-Cable recip sawzall. Users love the price and sturdy constructions, but some do note that it vibrates more than they expected. The corded reciprocating saw has a size of 22.8″ x 4.1″ x 7.6″, a 7.5-amp motor, a twist lock blade clamp, a variable speed trigger, a pivoting shoe, a soft grip handle, and a 6-foot PVC cord. The stroke length is 1-1/8 inches, and the maximum SPM is 3,200. The Porter reciprocating saw weighs 7.2 pounds, and it comes with one blade. In general, users praise the versatility, the efficiency, and the powerfulness of the Porter-Cable reciprocating saw. One buyer comments that this recip saw is exactly what he needs for his home projects, and he is extremely impressed with the quality and construction. The reviewer shared that even after over an hour of strenuous cutting, this corded reciprocating saw still worked with no problems. He would recommend it to anyone looking for the best sawzall. A happy user mentioned that this sawzall was perfect for his garden – in about 15 minutes he managed to prune his palm tree quickly without tiring his arms. However, some customers have complained that blade wore out quickly or that the saw stopped working after a couple of uses. If you need a reciprocating saw that is reliable, solid, and well-constructed, you might take a look at the Makita 11-amp reciprocating saw. Users love the quick blade change feature, but some do note that they had problems with the blade holder. The Makita sawzall has a length of 17-3/4-inches, an SPM up to 2800, a two-finger trigger with variable speeds, tool-less blade and shoe change, a soft grip handle, and it comes with a convenient plastic case for storage, plus two blades. It’s double insulated, and it weighs 7.1 pounds. Overall, this sawzall is a great choice if you need to do some heavy-duty cutting. 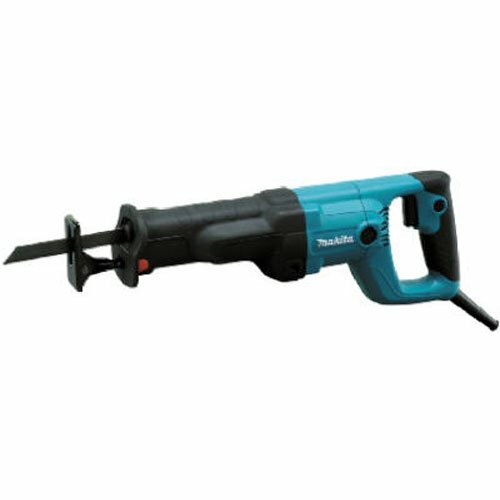 Overall, users are extremely satisfied with the performance of the Makita corded reciprocating saw, and most of them agree that this is the best sawzall that they have ever used. One buyer mentions that he has been using this recip sawzall regularly without any major issues for over a year, and he would recommend it to anyone looking for a top rated reciprocating saw. Another customer states that the Makita saw is comfortable to hold, and his hands don’t get tired as quickly as with other saws. A reviewer says that the instructions are clear and easy to understand, and even though she had never used a sawzall before she had no trouble to get the blade in or adjust the shoe. However, some customers have complained that the blade lock is defective, and it won’t retract in the locked position. There are a wide variety of reciprocating saws available on the market today blending a mixture of power, speed as well as power source. You can find reciprocating saws that are cordless or corded- and there are a bunch of quality options available for under $100 to choose from. The 6 pound, battery-powered 20 volt DeWalt reciprocating saw is one of the more popular options. It features a variable speed trigger, a 1" to 1/8" stroke length, a four position blade clamp to enable flush cutting, and a pretty lightweight and compact build. Buyers are fairly satisfied with this tool saying that this DeWalt reciprocating saw is especially functional because of its unique design and fulfills the quality standards expected from this brand. They also say that its unique design enables users to have greater control and that the lithium ion 20 Volt batteries run for a very long time. One reviewer says that it is his favorite reciprocator, and nominates as one of the best that's ever been made. He said that it is one of the fastest reciprocating saws that he is ever used, providing an incredibly strong up-and-down performance action, as well. For instance, the circular motion quickly saws through nails like they're butter. As a contractor who employs a number of construction workers on his crew, all he ever uses are DeWalt reciprocating saws, saying that they are powerful and durable tools for whatever job site applications the crew needs. He does say that after extended use that the blade shaft tends to deteriorate and it becomes difficult to remove blades. Once this blade release problem becomes particularly pronounced he ends up purchasing a new one. That said, they last for such a long time that the reinvestment in new reciprocating saws is not a significant expense for him and his organization. The Black + Decker Reciprocating saw was another popular option features a tool-free blade change, a variable speed trigger, and a stroke length that is 7/8". 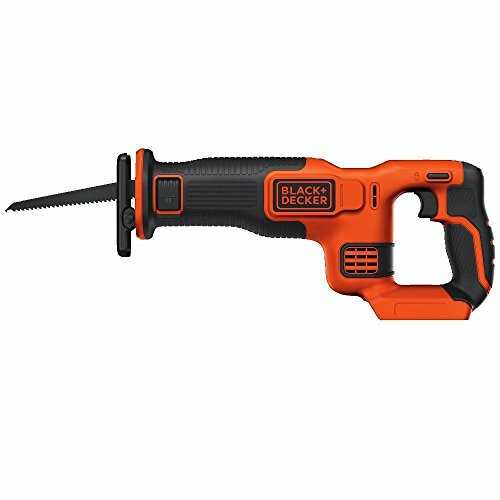 Overall, most users were satisfied with this Black + Decker reciprocating saw, even though the battery and charger were not included with their purchase. One buyer who was particularly price conscious and went shopping for a cordless reciprocating saw ended up buying it and was little bit surprised at how much it vibrated. He advises that you use gloves whenever you use it. Unfortunately for him, his saw broke after several uses and he had to do the repairs himself. He found that the connecting rod detached from the blade mechanism. He could have returned it for a repair, but being particularly handy, he was able to purchase some retaining rings and after a little tinkering he got the tool working again. Another novice reviewer describes purchasing this reciprocating saw for various DIY and home hobby repair work, saying that it is a well-constructed, solid-feeling saw. He found it particularly effective for trimming branches in his backyard, building a vegetable garden, as well as working with landscape timbers that were particularly thick- finding that the cuts were performed cleanly and properly. Another reviewer that we surveyed says that he primarily uses his reciprocating saw for trimming trees on his expansive property. Because it was fairly easy to change out blades, he found that this Black + Decker reciprocating saw was particularly useful working on tree stumps, roots, as well as thick branches, that required different blades to saw apart. Yet another reviewer that we corresponded with says that he bought this cordless reciprocating saw to work on hardened, rusted bolts that needed to be cut. He tried various other means of loosening these bolts, but eventually found that fitting the reciprocating saw with a hacksaw blade was the best means of cutting through them. Another home hobbyist was incredibly impressed by this reciprocating saw saying that he was working with thick sheet rock that had a wire mesh outer layer and he found that this Black + Decker quickly cut through everything, the studs, the nails the mesh as well as the outer plaster material. Many buyers were impressed that this cordless reciprocating saw seems to be as powerful as corded options, and not nearly as expensive. They're also pleasantly surprised that the weight and size of the tool was low enough that they could transport it to remote areas of their home without fatiguing themselves. The Makita Reciprocating saw was another solid option that we examined. It has an 11 amp motor and weighs around 7.3 lbs. providing a 1 to 1/8" blade stroke. One particularly savvy buyer lauded its included case, the quality brand name that backed up its solid construction, and its lightweight build. Other buyers say that the blade holder assembly is exceptional and has not malfunctioned to this date. Other reviewers say that blade removal is simple and painless. He also said that while it is ideal for a home hobbyist and home repair professionals, it could still perform adequately on most construction worksites. If you are in the market for a reciprocating saw, in our experiences it makes sense to draw up a list of criteria and then evaluate the different options available against it. Perhaps you are looking for a cordless as opposed to a corded option, or you are particularly price-conscious and are looking for a reciprocating saw under $100, or perhaps you are concerned with purchasing one that is the lightest weight in its category. Whatever the case may be, use the resources available on this page as a solid starting point for your eventual purchasing decision.